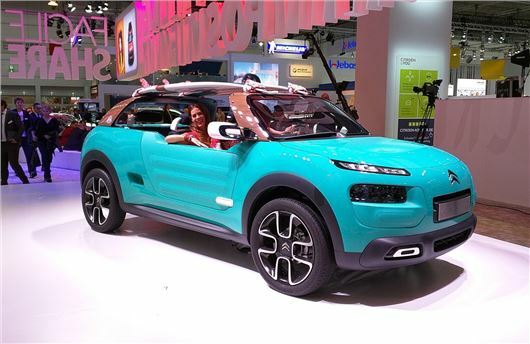 Citroen has unveiled a bold dune-buggy version of the C4 Cactus at the Frankfurt Motor Show. The Cactus M concept is inspired by the 2CV based Mehari and could pave the way for a new off-roading version of the French crossover. The front-wheel drive Cactus M has large, wide wheel arches and a raised ride-height and huge 21-inch alloy wheels. The most obvious difference, however, is the absence of a fixed roof, although it does have a rear rollover arch, meaning it can carry surfboards or other items that typically require a roof rack. Other features include a removable canvas roof can be used as a tent, while the futuristic modular cabin can be arranged to build a makeshift couch. The interior is finished with durable, outdoor-inspired materials and can even be hosed down when it gets dirty, thanks to integrated drainage in the foot wells. There's no four-wheel drive to speak of, but the Cactus M does get Citroen’s Grip Control system to help the front-wheels find grip on slippery surfaces, such as mud or wet grass. Power comes from a 110PS PureTech petrol engine linked to an EAT6 six-speed automatic transmission. There's no word on production yet – given the wackiness of the concept it’s unlikely to arrive in showrooms, but don’t rule it out entirely – there could be a less bonkers 4x4 version of the C4 Cactus instead.